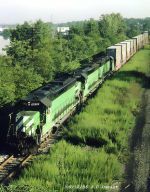 Description: SLN-4 approaches the RT-46 overpass at Ridgefield Park, NJ. The end of its run at Little Ferry is moments away. Description: Local WS 1 sits at the Wyckoff station on an early spring day. Description: The only giveaways in this set of power sitting at the Binghamton engine house are the patch paint on 6509, and the yellowjacket scheme on 6370. Otherwise it could be Idaho. We see both F45s in this photo. I only saw them once working back to back in freight service. BN 6640, to become NYSW 3638, turned into something of a hangar queen, and was beset by a variety of ills that kept it off the road a lot of the time. The trailing unit, 6370, became 3636, and was a steady presence on NYSW trains into the 21st century. Description: Train has backed onto the main and is pulling east towards CP BD. Train derailed in Franklin NJ later that night. Description: Doing the pull-by maneuver to reset the train (NY10) to head east to NJ. Description: Before Conrail allowed the NYSW and D&H to change crews on its main, the stack trains had to back off Conrail, who said they didnt want the trains tying up their railroad. This was understandable, since the crew change could take anywhere from ten minutes to ten hours, depending on if there was a crew ready. This SLN 3 is backed onto the ex DLW Utica Branch while waiting for a D&H crew. Meanwhile, out of sight on the D&H, a southbound is slowly making its way to BD and the yard across the river. Description: Shots of the north side of the Chenango River bridge are not often seen, since the sun lights that side only late in the day for a few months in the summer. I was there on one of those occasions, catching SLN 3 as it backed its 50 Sea Land platforms and 23 freight off the Tier at QD. Description: SLN 3 backs off the Tier at QD as a local fan catches the action. The Erie station stood where the empty space is between the Southern Tier and the ex DLW, whose station is now privately owned, and can be seen to the right of the train, under the Chenango St bridge. Description: Power off SLN 3 sits outside the engine house in Binghamton waiting for the next eastbound. The F 45 is still to be renumbered 3636, and the two SD's trailing it are still to be given the yellow jacket scheme. They'll eventually wind up back on the BN, only this time under MRL ownership. There's one peeking out of the house too. Description: SLN 5 behind an ex BN SD 45 is backed onto the Buffalo Runner adhacent to the old D&H station as it waits for a D&H crew to take it to Buffalo. 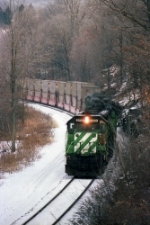 Description: NTV 4 symbol on Conrail, the train is nearing the overpass with former Erie mainline at Greycourt. Description: At this time, Conrail would not let NYSW change crews out on the main for the D&H to take the train west. This was not without some justification, as the new crew could be anywhere from ten minutes to ten hours from getting on the train. As a result, NYSW had to back its train up into Bevier St, or onto their Utica Branch for the crew change. SLN 5 is doing just that at QD with three ex BN SD 45s. There more than enough room for the 55 Sea Land stacks and 18 freight. Lead unit 6366 doesn't seem to be sure what railroad it wants to run for. Description: I had just shot TV 301 here 20 minutes earlier in good sun. Now SLN 5 shows up, and its cloud city. Such is the fickle weather of the Southern Tier. Three SD 45s do the job today, a familiar sight to anyone who watched the EL run here. It's a good bet at least one of these units was here under BN ownership. 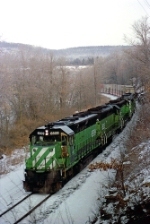 Description: SLN 5 rolls past Hankins, a wide spot on NY 97 about 70 rail miles from Binghamton. Staying at it!! Description: SLN 5 behind three ex BN SDs crosses the famous Mill Rift bridge over the Delaware as it makes its way into Pennsylavnia, where it will run til just before it reaches Narrowsburg with its 50 Sea Land platforms and 7 freight. Seen from the NY side. 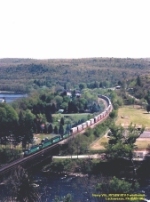 Description: OIBU holds at the west end of Port Jervis yard while NYSW SLN 5 rolls past. Just not his day. Description: NY 10 is pulled up into Bevier St yard awaiting a new crew for the final leg to Jersey. 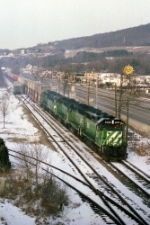 Conrail will not let the D&H/NYSW stacks change crews on their main, so they have to pull into either the D&H yard at East Binghamton, or onto the Buffalo Runner and the Utica Branch. When the new crew is on, they will back the train out onto CR at QD, then head east. Description: In a seldom seen angle, NYSW 6370 leads a pair of ex BN SD 45s with a westbound stack train on the Chenango River bridge.